Following the storm that broke out after the government's decisions this Sunday in acquiescence to the ultra-Orthodox political parties' demands to suspend the “Kotel Compromise” and pass the Conversion Law, Hiddush commissioned a poll to gauge the public reaction to these decisions. About two-thirds of the adult Jewish population in Israel opposes these government decisions! These are the unequivocal findings of the survey conducted by the Smith Polling Institute on June 27, 2017 among a sample of 500 respondents representing the adult Jewish population in Israel (sampling error 4.5%). This latest public opinion survey joins an ongoing, periodic series of surveys commissioned by Hiddush since its founding, which illustrate the Israeli public's opposition to the government's policies on matters of religion and state. Overwhelmingly, the public supports expanding freedom of religion and conscience in Israel, such as in the areas of right to family and marriage freedom. The government representatives' spin has clearly failed, and the public is not accepting their excuses, such as 'preserving the status quo.' The survey findings prove how far the government has swerved away from the public will and the needs of the State of Israel. Instead, the government leaders are nothing more than puppets whose strings are being pulled by the anti-Zionist, ultra-Orthodox political parties. The survey findings are especially important in light of the claims made by the supporters of these government decisions that most Israelis support the Orthodox Rabbinate's control over the Western Wall plaza and object to allowing the non-Orthodox streams and the Women of the Wall to pray according to their beliefs. They misrepresent the reality claiming that a ‘tiny minority’ is trying to impose the foreign liberal religious streams' worldview on Israel. A clear example of this deliberate ignoring of the public will are the words of MK Bitan (Likud), the Coalition Chairman, who explained the Coalition's support for the State Conversion Bill in an interview : 'We are a country with a clear Orthodox majority, and even those who are secular think of themselves as Orthodox.' Hopefully, the storm that has erupted and caused the leaders of American Jewry to forcefully join with Israelis to oppose these decisions will open the Prime Minister's eyes to see that he and his government have crossed a red line and will pay the price for harming Israel's strategic interests and undermining Jewish unity in Netanyahu’s perpetual surrender to the ultra-Orthodox politicians. 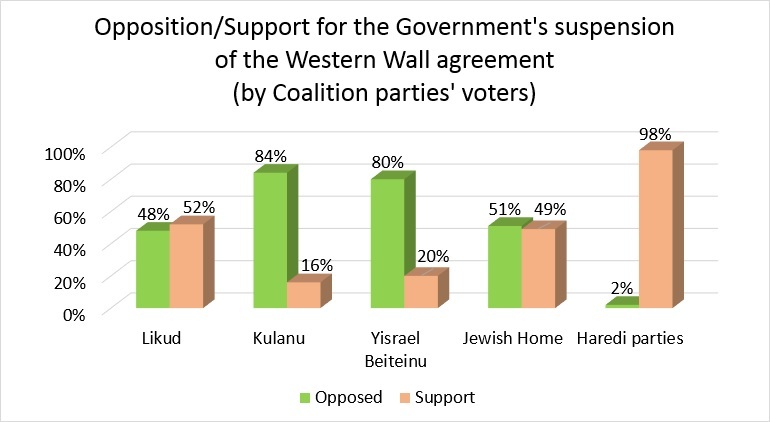 63% of the adult Jewish public expressed opposition to the government's decision to suspend the Western Wall agreement; only 37% supported it. Among those who opposed it were 32% of the Zionist Orthodox, 55% of the "traditional, close to religion," 69% of the "traditional, not so close to religion," and 84% of the secular Jews! Among immigrants from the former Soviet Union, 82% were opposed. The distribution of responses according to their votes in the last Israeli elections also indicates the extent and scope of the resistance: 80% of Yisrael Beiteinu voters, 84% of Kulanu voters, 51% of Jewish Home party voters, and 48% of Likud voters are opposed. As expected, among voters for the Opposition parties, disapproval is even higher: 94% of Zionist Union and Meretz, and 84% of Yesh Atid voters. Regarding the approval of the State Conversion Law, 64% opposed it, while only 36% supported it. Among those who identify as "traditional, not so close to religion," a greater percentage (77%) oppose the conversion law than the suspension of the Western Wall agreement (69%). Among those who are "traditional, close to religion” 48% oppose the Conversion Law, as do 22% of Zionist Orthodox Israelis; these two sectors indicated greater opposition to the suspension of the Western Wall agreement. As for the public's positions according to their votes in the last Israeli elections, the majority of Likud (57%), Kulanu (80%), and Yisrael Beiteinu (84%) voters oppose the State Conversion Law. 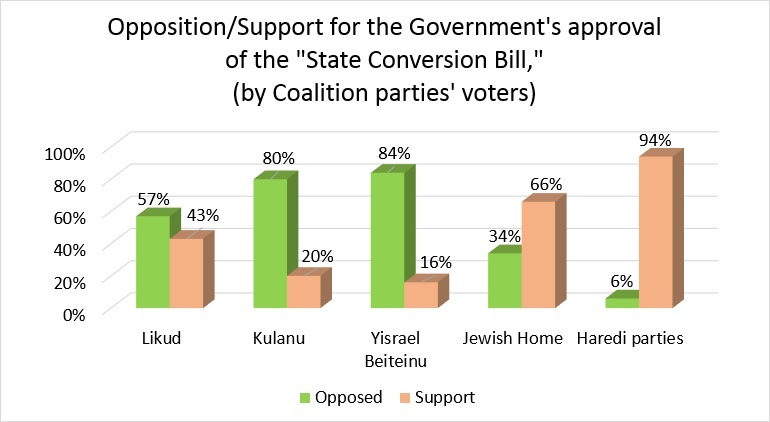 Among the opposition parties, 91% of Zionist Union and Meretz, and 89% of Yesh Atid voters were opposed to the State Conversion Law. At the demand of the ultra-Orthodox political parties, the government decided to suspend and not implement the "Western Wall agreement," which was intended to provide for a prayer alternative for Women of the Wall and Reform and Conservative groups in the Robinson's Arch area of the Western Wall. 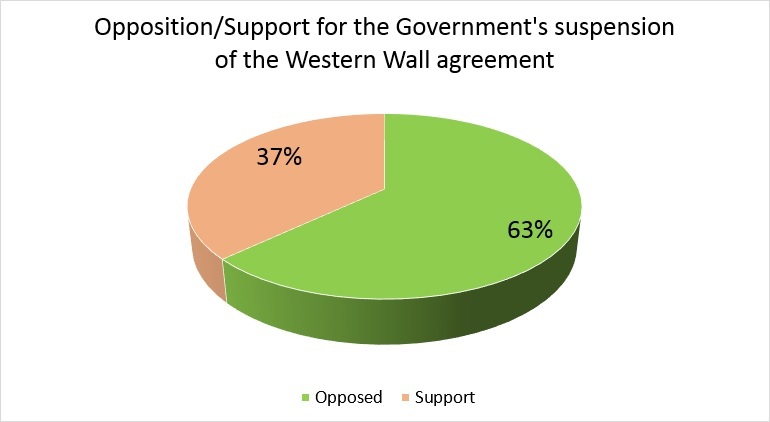 Do you support or oppose the government's decision not to implement the Western Wall agreement? The Ministerial Committee on Legislation approved, [Ministers Liberman and Steinitz dissenting], the demand of the ultra-Orthodox political parties to enact the "State Conversion Law". The bill is intended to circumvent Supreme Court rulings to establish for the first time that regarding conversions performed in Israel, the state will only recognize those performed by the Chief Rabbinate's rabbinical courts, and not conversions of liberal Orthodox rabbinical courts or conversions of Reform and Conservative rabbinical courts. Do you support or oppose the Knesset passing such legislation?